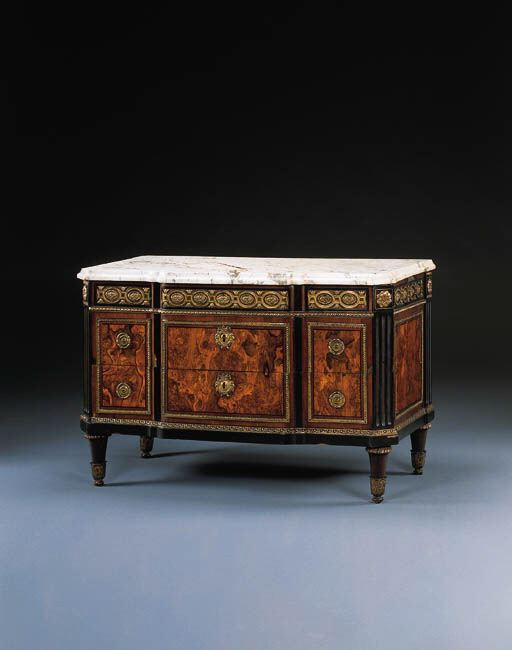 This striking commode, with its unusual use of plain expanses of richly figured yew wood in combination with finely chased, boldly scaled neoclassical mounts, relates to a secretaire reputedly supplied to Mme du Barry by the little-known ébéniste Philippe Pasquier (illustrated C. Packer, Paris Furniture, Newport, 1956, fig. 138). The Pasquier secretaire also has virtually identical feet with acanthus-cast sabots and gadrooned headings. Pasquier, who received his maîtrise in 1760, also worked for the prince de Condé. A plainer commode by Pasquier, also veneered in yew wood, is illustrated in P. Kjellberg, Le Mobilier Français du XVIIIe Siècle, Paris, 1989, p.635.